Last December, my wife found a free 8 week delivery offer from the National Post if she took an online survey via the National Post website. There were no strings attached to this free subscription, even for those who previously subscribed and left the paper for whatever reason. 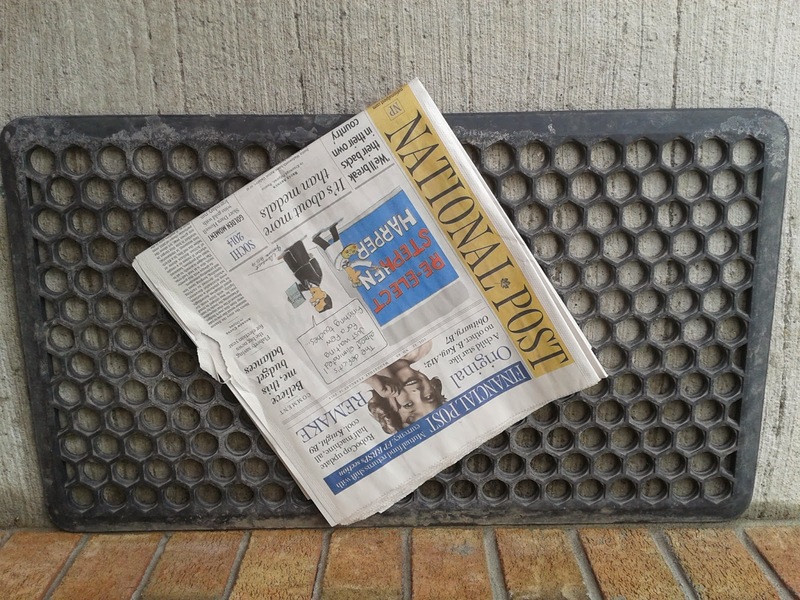 Previously, we had enjoyed a free 3 month subscription to the National Post when living in Richmond Hill. We had only one missed delivery to our Richmond Hill home and then everything was tickety boo with the paper arriving like clockwork. Your complimentary Monday to Saturday 8-week trial will begin on January 6, 2014 and you will continue through to March 1, 2014. Great! A free subscription to the National Post after the holiday season. Might try it out to see how it compares to the what we received in Richmond Hill in 2010. The first day of January 6th I opened the front door and peered out. Nothing on the doorstep and nothing on the driveway either. Did a quick rescan before shrugging my shoulders and heading inside dejectedly. Same thing on Tuesday January 7th as well. There was no loss so to speak of as this was "free trial". At this point I was eagerly awaiting nothing to be delivered and the 8 week deadline to go by for the usual phone call from the Post's subscription services department asking us if we liked our free subscription and wanted to continue with a paid one. Surprise! A week later on Monday January 13th I happened to take a peak out the front door to see what the street was like weatherwise when I noticed the mailbox lid was slightly askew. I opened the mailbox to find that days edition of the paper. Things went swimmingly for the next month with the newspaper always in the mailbox before 6:30 A.M. That was until Thursday February 13th when the mailbox was emptier than a plate of cookies with a certain blue monster around. My wife picked up the phone and called the National Post's subscribers number to inquire. Of course the automated system picked up and said "all the customer service representatives are currently busy, our automated system is available to help". So she worked her way through pressing numbers here, there and everywhere. Next we waited on hold for "Ottawa Citizen Customer Service" to pick up. Approaching 10 minutes into the phone call we were wondering if there was even a "Customer Service Representative" even available? Fortunately, the Ottawa Citizen's customer representative picked up. We inquired about our free subscription status to the National Post. She pulled up our information and said that it was a "1 month free subscription promotion that has ended". We declined to subscribe for further delivery of the paper and hung up the phone. As of today, no reply from Twitter or any resumption of delivery for the National Post newspaper. Considering it was free, I'm not worried about it as I'm out nothing financially. But the offer to sign us up for a paid subscription when the National Post couldn't even deliver for the time frame promised for the free subscription does sting. If I pay for an 8 week subscription would the National Post unilaterally shorten the subscription down to a 1 month or 4.5 week subscription? For this, the National Post and, it's parent company, Postmedia failed to deliver on this promotion.